➦In 1908...Walter Lanier "Red" Barber born (died October 22, 1992 at age 82). 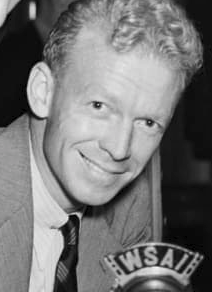 Barber was an American sports commentator, nicknamed "The Ol' Redhead", was primarily identified with radio broadcasts of Major League Baseball, calling play-by-play across four decades with the Cincinnati Reds (1934–1938), Brooklyn Dodgers (1939–1953), and New York Yankees (1954–1966). Like his fellow sports pioneer Mel Allen, Barber also gained a niche calling college and professional American football in his primary market of New York City. Barber was born in Columbus, Mississippi. The family moved to Sanford, Florida in 1929, and at the age of 21, he hitchhiked to Gainesville and enrolled at the University of Florida, majoring in education. It was there in January 1930 that Barber got his start in broadcasting. An agriculture professor had been scheduled to appear on WRUF, the university radio station, to read a scholarly paper over the air. When the professor's absence was discovered minutes before the broadcast was to begin, Barber, who working as a janitor, was called in as a substitute. It was thus that the future sportscaster's first gig was reading "Certain Aspects of Bovine Obstetrics". After those few minutes in front of a microphone, Barber decided to switch careers. He became WRUF's director and chief announcer and covered Florida football games that autumn. Then he dropped out of school to focus on his radio work. After four more years at WRUF he landed a job broadcasting the Cincinnati Reds on WLW and WSAI when Powel Crosley, Jr., purchased the team in 1934. ➦In 1947...During the Cold War, The Voice of America started broadcasting to the Soviet citizens in Russia under the pretext of countering "more harmful instances of Soviet propaganda directed against American leaders and policies". The Soviet Union responded by initiating electronic jamming of VOA broadcasts on April 24, 1949. ➦In 1962...actor Joseph Kearns, best remembered for his role as George Wilson ("Mr. Wilson") in the CBS television series Dennis the Menace died after a cerebral hemorrhage at age 55. Kearns joined the staff of radio station KSL in Salt Lake City in 1930 remaining there until 1936 when he moved to Los Angeles, where found regular work in network radio. ➦In 1972...Los Angeles radio station KDAY played two new Rolling Stones tracks non-stop for a day after obtaining stolen tapes from the home of producer Marshall Chess home. ➦In 1979…Garrison Keillor's "Prairie Home Companion" was first broadcast nationally. It's first radio broadcast on Minnesota Public Radio in 1974. 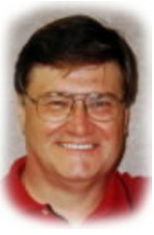 ➦In 1991…Radio DJ Gary Gears died from a heart attack at age 46. Gary Gears may have had one of the best voices of all. According to Jeff Roteman's WLS Tribute website, The "Big G" joined WLS in 1971 after a brief stop at WCFL. Gary started at the Big 89 doing the 1-5 am overnight shift. By 1972, Gary had moved to middays working 9 til 12 noon replacing Joel Sebastian. In 1973, Gary was replaced by J.J. Jeffrey. Gary Gears spent time at the legendary KOIL in Omaha before joining and serving in the US Armed Services. Gary was heard on AFVN radio in Vietnam. After his time in the service, Gary went to KQV in Pittsburgh from Minneapolis St Paul. After leaving Pittsburgh , Gary spent most of his career in Chicago at legendary stations WCFL, WLS and many others including WDAI, WIND, WJEZ, WJJD, WKQX, WMAQ and WRQX. He also spent time at CHUM in Toronto. 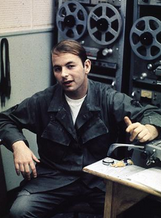 He served in Vietnam where he was a DJ at AFVN in Saigon. Gary's voice was heard on commercials all over the country in the 70's. ➦In 1994...Radio personality Barney Pip (real last name: Pipenger) was killed in a traffic accident in Indianapolis. He burned to death in the accident. An article in Radio & Records said it was two weeks before his body was identified. Pip started his career in 1959 with notable stops at WCFL Chicago, WPIX FM NYC and WIFE Indianapolis. He also worked at WJET Erie, Pa., WEEP Pittsburgh, WGLI Babylon, N.Y., WOKY Milwaukee, WIFE Indianapolis, WHHY Montgomery, Ala. Consolidation, declining revenue, combative language from the Trump Administration, and occasional violence marked 2018 for members of the media. It was also the year with the highest number of job cut announcements in the sector since 2009, according to the monthly Job Cut Report compiled by global outplacement and executive coaching firm Challenger, Gray & Christmas, Inc.
Last year, media companies, which include movies, television, publishing, music, and broadcast and print news, announced plans to cut 15,474 jobs, 11,878 of which were from news organizations. That’s 281 percent higher than the 4,062 cuts announced in the media sector in 2017. In fact, it is the highest total since 2009, when media organizations announced plans to cut 22,346 jobs. “Members of the media, especially journalists, have had a tough few years. Many jobs were already in jeopardy due to a business model that tried to meet consumer demand for free news with ad revenue. As media outlets attempted to put news behind pay walls, in many markets, consumers opted not to pay,” said Andrew Challenger, Vice President of Challenger, Gray & Christmas, Inc.
“The result is a loss of great journalists, leading to more work for the few that remain,” he added. This year is off to a rough start for media organizations as well. 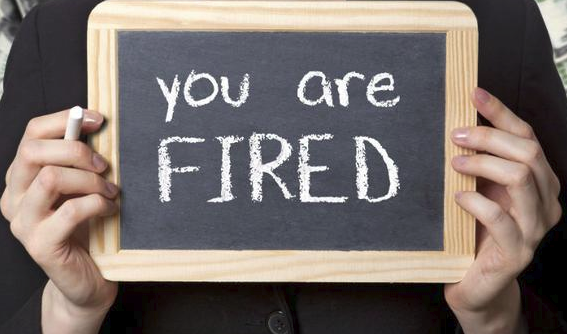 In January, 1,279 media sector job cuts were announced, up 49.6 percent from the 855 announced cuts in the same month last year. Gannett and McClatchy, which own hundreds of local papers, announced several rounds of cuts last year. BuzzFeed garnered attention after announcing layoffs for approximately 200 employees in January. Meanwhile, Verizon announced 800 cuts in its media division, which includes Yahoo, AOL, and HuffPost properties. In BuzzFeed’s case, CEO Jonah Peretti cited the need to build a firm foundation for the company and make it sustainable for the future. In response, on Tuesday, February 12th, journalists at BuzzFeed announced their intention to unionize with the NewsGuild of New York. Tech giants are certainly part of the problem, especially in terms of advertising revenue. According to Bloomberg, Facebook and Google combined make up approximately 58 percent of the digital advertising market, and Amazon is looking to improve on its 4.2 percent share. This leaves less than half the market open for the large number of media companies that rely on ad revenue to survive. These media companies are also at a large disadvantage when it comes to tailoring ads to customers. Facebook is known for its incredibly customized ads because of its ability to collect years of user data, which allows ads to target specific and niche interests. Google is also able to utilize search data to promote ads that will appeal to specific customer segments. 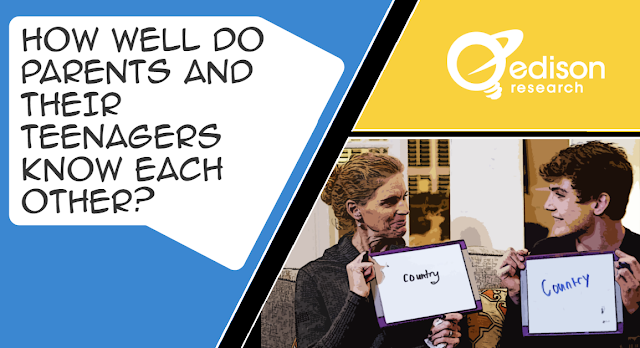 These methods allow both companies to gain higher impression and click-through rates, which lead to higher revenue. 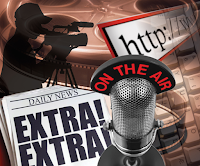 Other media outlets often struggle with ad-blocking extensions. Adding extensions on browsers to block ads is common and it allows consumers to view content while avoiding the ads that make media companies money. These ad blockers often do not work on Facebook or Google, especially on each company’s apps, which allows them to make money while other web pages struggle to circumvent this technology. 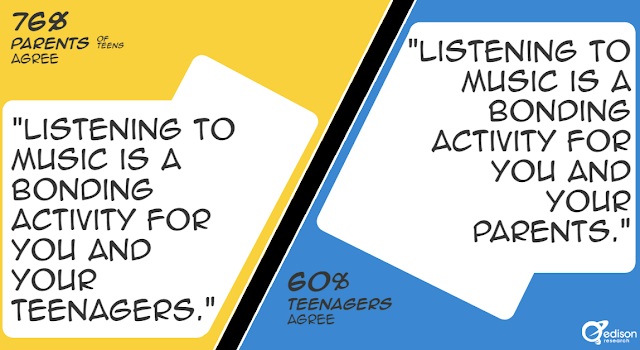 “This has several potential implications for the future of the media sector. Job cuts and consolidations are likely to continue until these companies are able to find ways to create growth in revenue streams. Meanwhile, more news organizations may move to a subscription-based revenue model. The trick there is convincing consumers of the importance and value of real, unbiased, and uninfluenced news,” said Challenger. “Another possibility for media companies is to monetize users’ personal data, as Facebook and Google have. There are obvious ethical implications and potential legal issues, however, especially as privacy laws begin to pass in various jurisdictions across the country. Ultimately, the quality of the country’s news will start to decline if we as users refuse to pay for it,” he added. 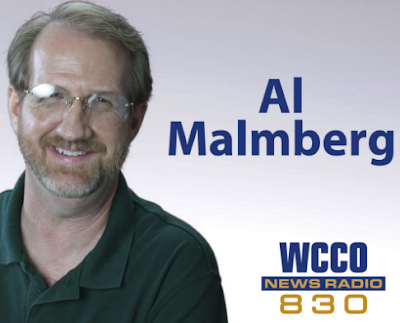 Entersom's WCCO 830 AM has canceled "The Al Malmberg Show." It's not the first time. The talk-show host was first let go in 2008, then rehired in November 2013 to do an evening show from his barn in Colorado. On Tuesday, Malmberg was told his show would no longer air; station management has declined to comment on the reason or what its long-range plans are to run starting at 9 p.m. weekdays, reports The Star-Tribune. "I absolutely love 'CCO and the 17 years I spent there," Malmberg said Friday morning. "It was great when they asked me to come back and they made it so easy for me to do from Colorado where I could spend time with my grandkids. Sometimes on the air, you could even hear the coyotes in the background. It was the best of both worlds." Malmberg, 68, said he hasn't decided whether to look for another radio gig or retire. Cumulus Media announces that it has appointed Bay Area on-air personality Mark Willard as Host of “KNBR Tonight”, a two-part weeknight show on San Francisco sports radio station KNBR 680 AM. Willard will debut on KNBR on Monday, February 18th. He will host the 7p-10p portion of “KNBR Tonight”, while current KNBR 680 host Drew Hoffar moves to a new timeslot hosting “KNBR Tonight” from 10p-Midnight, as they team up to entertain the Bay Area’s most passionate sports fans at night. Willard is a Foster City native who comes to KNBR from a midday hosting role with XTRA 1360AM in San Diego. He has previously hosted shows on FOX Sports Radio Network, as well as 710 ESPN and ESPN’s SportsNation, based in Los Angeles. He is a lifelong fan of Bay Area sports teams. Hoffar grew up in San Leandro and been a host on KNBR for over three years, first as primary host of “The Audible” morning show on KNBR 1050, then as the lead host of “KNBR Tonight” on KNBR 680. 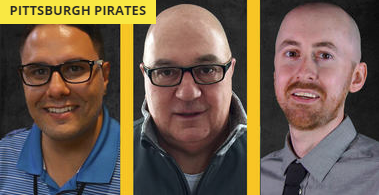 Entercom has announced the new broadcast team for pregame and postgame coverage of the Pittsburgh Pirates on KDKA 93.7 The Fan, the flagship station for the team. Dan Zangrilli will return to host the station's pregame and postgame broadcasts, a role he previously held from 2012 to 2016. Jack Zduriencik returns for his fourth season as an analyst. Station veteran Kraig Riley, who has been with 93.7 The Fan since 2010 as a producer, will join the broadcast team for the first time alongside Zangrilli and Zduriencik. Zduriencik joined the station in 2016 after serving as General Manager of the Seattle Mariners for eight years. He was also part of the Pittsburgh Pirates organization as Scouting Director from 1991-1993. 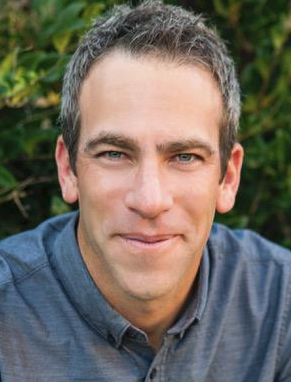 "We are thrilled to welcome Dan back to Pirates baseball, and excited to offer Pittsburgh a new voice in Kraig Riley," said Entercom Pittsburgh Senior VP/Market Manager Michael Spacciapolli. "In addition, the incredible insight we get on a daily basis from Jack makes this is an exciting next phase of our Pirates coverage. As the sports radio leader, we will continue to expand our partnership with the Pirates and offer the very best coverage of the team across our platforms." 93.7 The Fan's broadcast coverage of Pittsburgh Pirates baseball begins with the team's 2019 regular season opener on March 28. Select coverage of the Grapefruit League spring training games will begin on Saturday, February 23. 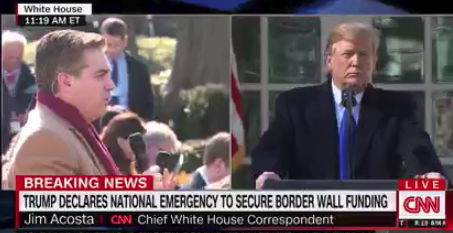 President Trump scolded CNN’s Jim Acosta on Friday during the president's Rose Garden announcement that he is declaring a national emergency on the southern border, telling the reporter he has “an agenda” -- before angel moms in attendance confronted the chief CNN White House correspondent. According to Fox News, the clash came as Acosta challenged Trump over what he described as a "disconnect" concerning his description of illegal immigration. As Acosta tried to keep talking, Trump repeated himself. “Do you really believe that stat? Take a look at our federal prisons,” Trump said as he gestured Acosta to hurry up with his longwinded question. “What do you say to critics who say that you are creating a national emergency? That you’re concocting a national emergency here to get your wall,” Acosta said. Trump pointed to angel moms in attendance, asking them for their thoughts. Trump told Acosta the statistics he provided were “wrong” and told him to take a look at the federal prison population for proof. 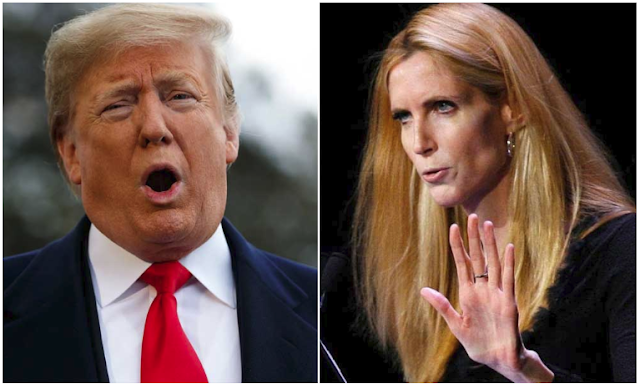 President Donald Trump praised Sean Hannity, Rush Limbaugh, Tucker Carlson, and Laura Ingraham when asked what conservative voices helped to shape his views on declaring a national emergency, Variety reports Trump singled out one right-wing personality he does not follow: Ann Coulter. Coulter has been a vocal critic of the president as he has tried to secure money to build the wall — attacking not just the government funding bill, which she says will constrain his power to build it, as well as the emergency declaration. His comments about Coulter came after NBC News’ Kelly O’Donnell asked Trump which conservative voices helped to shape his views on his decision to declare a national emergency. “Sean Hannity has been a terrific, terrific supporter of what I do. Not of me. If I changed my views, he wouldn’t be with me,” he said. “Rush Limbaugh, I think he is a great guy. He can speak for three hours without a phone call. Try doing that some time. For three hours he speaks. He’s got one of the biggest audiences in the history of the world. 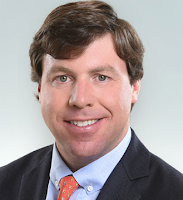 I mean, this guy is unbelievable.” He also offered praise for Carlson and Ingraham, two other Fox personalities. MSNBC’s “Morning Joe” panel on Friday was unanimous in slamming Rep. Alexandria Ocasio-Cortez for her role in pressuring Amazon to scrap plans for its second headquarters in New York City. Amazon announced Thursday that it would no longer be building a second headquarters in Long Island City, a plan that promised at least 25,000 new jobs. 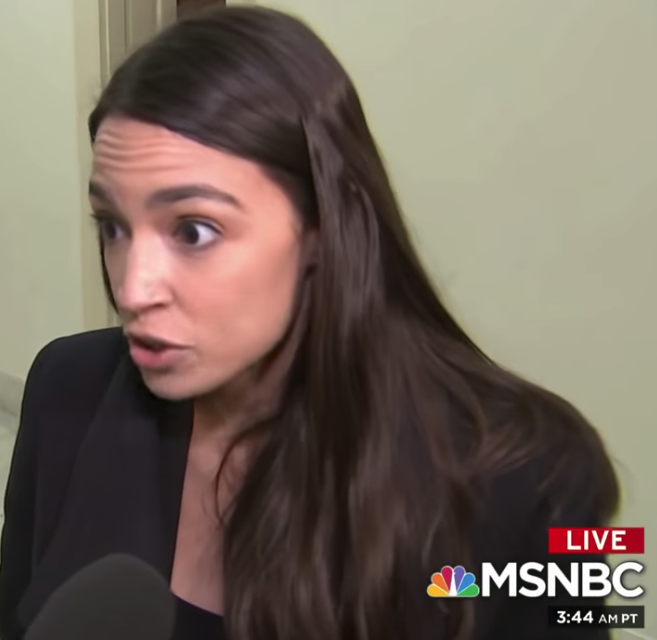 The company cited pressure by Ms. Ocasio-Cortez and state and local officials in explaining its decision, saying it didn’t care to work in an environment where it wasn’t welcomed. Ms. Ocasio-Cortez, who holds a degree in economics, celebrated the news as a victory for working-class Americans against the “richest man in the world,” Amazon CEO Jeff Bezos, and claimed that the billions of dollars in promised tax incentives could be used in more productive ways. “She’s just wrong,” Ms. Del Percio said. “It’s not like you have this pile of money that is going to Amazon. This is a tax incentive. You cannot fund schools with money that does not exist — that’s part of the budget process. Federal Communications Commission Chairman Ajit Pai is threatening major wireless carriers with "regulatory intervention" if they don't take action to stem robocalls. According to a study referenced in a new FCC report, nearly half the calls made to US cell phones in 2019 will be spam. On "America's Newsroom" Friday, Pai said that in addition to imposing major fines on scammers, his agency has demanded that the phone industry step up and adopt robust caller ID authentication, which he described as "a digital fingerprint for every single phone." "It's very easy to spoof a phone number. Even if you're calling from abroad, you can make it look like you have the same area code and the same first three numbers as somebody who's living in a small town in Iowa," Pai explained, revealing that he doesn't answer his phone unless he already has the number saved. Host Sandra Smith noted that the FCC is threatening corporate regulation if there is no change, which she said is unusual under a Republican administration. "This is our top consumer protection priority, this is something that I hear about all the time, including from members of my own family," Pai said. "And the law is pretty clear here. The FCC does have the authority to take action to protect consumers, to make sure that these robocalls aren't bombarding American consumers." Spoke Media has partnered with popular former Panoply podcast Family Ghosts to co-produce and distribute the show’s second and third seasons. The partnership sees a podcast that boasts a loyal fanbase and has reached the coveted Top Ten of the Apple Podcast Charts joining with a content team responsible for six Apple Top 200 podcasts. 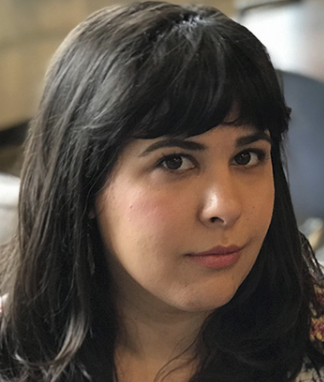 After an unexpected hiatus in the wake of Panoply’s shutdown of editorial operations last fall, Sam Dingman (Family Ghosts creator and host) is excited to get the show rolling again, saying, "From my first conversations with Keith, Alia, and all the artists and storytellers on the Spoke team, I could tell that we shared an array of passions around art and storytelling. I'm so grateful for the opportunity to continue Family Ghosts in partnership with them, and can't wait to get our stories back in the headphones of the Ghost Family." Family Ghosts is the first in a new slate of shows coming from Spoke Media in 2019, and will return to audiences on all podcast platforms on May 15th for its second season, with a third season set to premier later in the year. 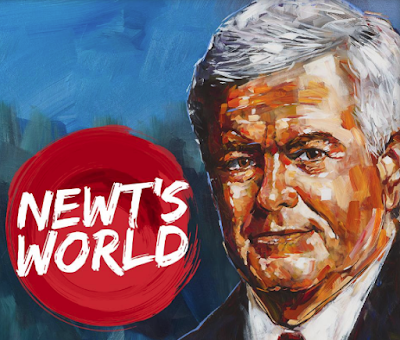 Westwood One and Newt Gingrich, historian, futurist, and former Speaker of the U.S. House of Representatives, have partnered to create Newt’s World, a weekly, original podcast for independent thinkers. Launching on Sunday, February 17, this show will offer stories, conversations, and context on a different topic each week, from history to health, national security to science, and much more. It will be promoted across the entire Westwood One platform and Newt’s enormous following of influencers and fans. Newt’s World isn’t a podcast about politics; it’s a show that explores the past, present, and future to help listeners contextualize current events and important discoveries across all aspects of our society. The inaugural episode of Newt’s World features the father of our country, the man who led the first Americans to freedom, George Washington. The second episode, also launching on February 17, will describe what people are calling the largest U.S. House cover-up in history. Other soon-to–be-released episodes include, “Sally Can See – How Gene Therapy is Curing Childhood Blindness” and “5G – The Next Industrial Revolution.” Future episodes will explore the perils of opioid addiction, great leaders in history, advancements in organ transplantation, the nuances of spycraft, and many other interesting topics. Longtime Los Angeles news anchor Diane Thompson retired Friday at Entercom's KNX 1070 AM. Covering events such as the 1984 Olympics, 26 Academy Award ceremonies, 14 Rose Parades (one in which her 4-year-old son at the time vomited on her during a live report), the opening ceremonies of the Reagan Library, the official visits of both Pope John Paul II and South African president Nelson Mandela, and interviewing hundreds of people for her well-known KNX Hero of the Week feature series, Thompson is a memorable veteran in the business. According to the KNX website, Thompson’s first job was in 1979 at KVUE-TV in Austin. After a brief stint in Phoenix, she moved to Los Angeles to work at the legendary station KFWB, then KHJ, and then to KNX – where she’s been for the last 34 years. Thompson has been on the scene of countless major news stories over the years. From the Los Angeles riots to both the San Francisco and Northridge earthquakes, the Simpson and Goldman murders, the Cerritos mid-air collision between a commercial jetliner and a private plane; to her breaking the story nationally of the murder of actor Phil Hartman. She has covered 1984 Olympics, 26 Academy Award ceremonies, 14 Rose Parades (one in which her 4-year-old son at the time vomited on her during a live report), the opening ceremonies of the Reagan Library, the official visits of both Pope John Paul II and South African president Nelson Mandela, and interviewing hundreds of people for her well-known KNX Hero of the Week feature series. Ken Charles KNX program director says that although he’s happy for Thompson, it’s bittersweet, as he knows how much listeners will miss her. 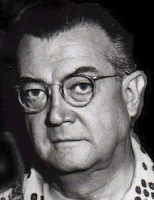 ➦In 1901...American musician, songwriter, singer and orchestra leader Wayne King was born. In the 1930`s he was heard on NBC and CBS radio networks in weekly half-hour broadcasts for Lady Esther cosmetics, a line he is credited with popularizing. In the mid-40`s he was a summer replacement for the Jack Benny and Jimmy Durante programs. Known as 'The Waltz King', the saxophonist and bandleader died July 16, 1985 at age 84. 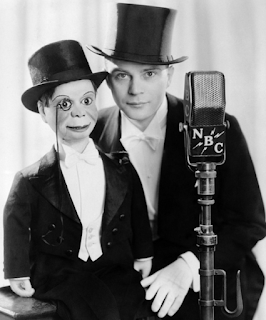 ➦In 1903...American actor, comedian and radio performer, Edgar Bern was born (died September 30, 1978 at age 75). He was best known for his proficiency in ventriloquism and his characters Charlie McCarthy and Mortimer Snerd. He was also the father of actress Candice Bergen. He had a featured Sunday evening show first on NBC and then on CBS Radio from 1937 to 1955. ➦In 1922...WDAF (now Sports KCSP) was started by the Kansas City Star. The official starting date is open to dispute, because the Star's broadcasting activities pre-dated WDAF. 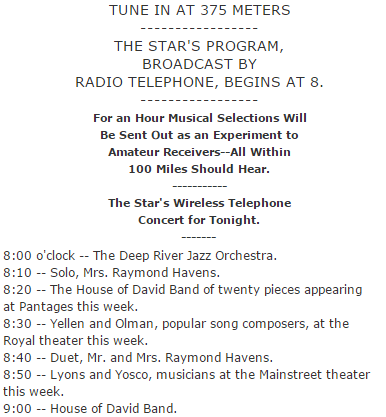 The Star adopted the WDAF call letters May 16, 1922. WDAF bounced around various frequencies, traveling to 750, 730, 680, 820 and 810 kHz. WDAF moved to 610 kHz in 1928, splitting time with station WOQ. WDAF joined the NBC radio network before moving to 610 kHz, running both Red & Blue programs up until 1930, when they became a primary NBC Red affiliate. 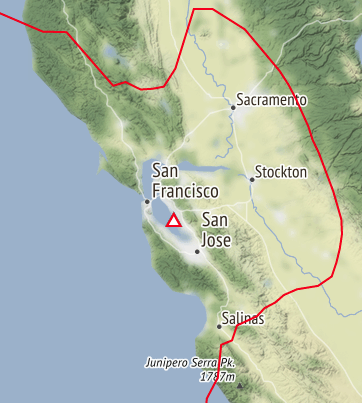 It also had become the westernmost affiliate of the NBC Red Network. WDAF retained its NBC affiliation well into the 1960s. 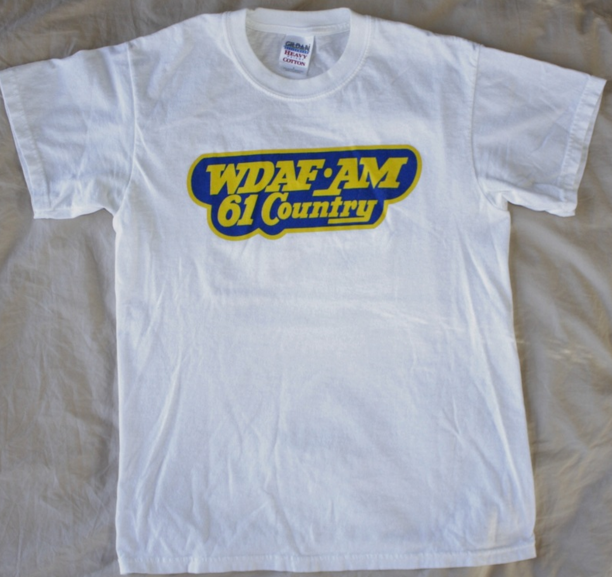 WDAF changed its call letters KCSP on September 23, 2003, after moving the longtime country music format to the FM. Entercom still maintains the WDAF-FM call letters at 106.5. Today KCSP airs Sports Talk. ➦In 1929...KID-AM in Idaho Falls, Idaho, went on the air. The station was first licensed under the call KGIO, and began broadcasting on December 3, 1928 on a frequency of 1320 kHz. On February 16, 1929, the call was changed to KID, and the station began broadcasting under this call. 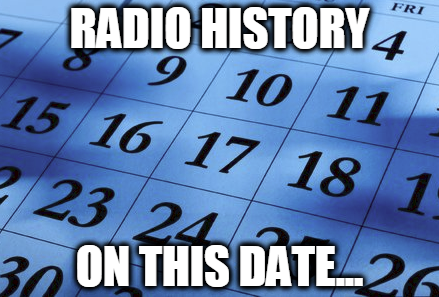 The station had moved to 1350 kHz by 1942 (likely in the March 29, 1941 changes, pursuant to the North American Radio Broadcasting Agreement, that saw many stations raise frequency by 10 to 30 kHz), where it stayed for several years. In 1950, the station changed from 1350 to its current 590 kHz frequency. Today the station is owned by Townsquare Media and airs a News/Talk format at 590 AM. 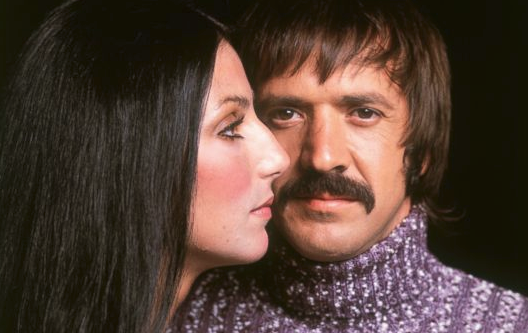 ➦In 1935...Salvatore Phillip "Sonny" Bono (died January 5, 1998 at age 62) was born He was an American singer-songwriter, producer, actor, and politician who came to fame in partnership with his second wife Cher, as the popular singing duo Sonny & Cher. He was mayor of Palm Springs, California from 1988 to 1992, and the Republican congressman for California's 44th district from 1995 until his death in 1998. The United States Copyright Term Extension Act of 1998, which extended the term of copyright by 20 years, was named in honor of Bono when it was passed by Congress nine months after his death. Mary Bono (Sonny's last wife) had been one of the original sponsors. ➦In 1955...In Odessa, Texas, Elvis Presley performed two shows at the senior high school. 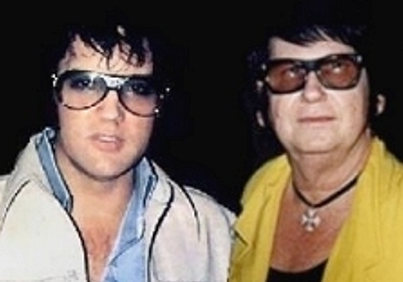 Roy Orbison, who was introduced to Elvis by Johnny Cash, remembered the performance, "His energy was incredible. His instinct was just amazing." ➦In 2010..Popular American voice-over artist JR Nelson and former WHTZ Z100 NYC personality and creative genius, died after a three-year battle with cancer. He was 60. He was born in Oak Harbor, Ohio, and reached nearby airwaves in his teens. "I did everything the usual kid does, run the gospel tapes and all that kind of stuff. By the time I was a senior in high school, I was hired to do mornings at a station in Toledo." He went to the University of Montreal and worked on radio in that city. He later worked in Tulsa, Kansas City, San Francisco, Columbus and more. 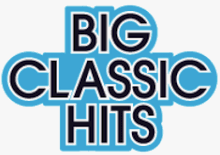 On and off, from the 1970s into the 1990s, at the mike or behind the scenes, Nelson worked for several Cleveland stations or their parent companies, including WGAR, WBBG, WGCL, WHK, WMMS and WMJI. At WMJI, he once played Roy Orbison's "Mean Woman Blues" for more than an hour on a Saturday night. Nelson spent some of the 1980s helping to create the "Morning Zoo" at WHTZ, quickly boosting the station's ratings from dismal to dizzying. His last steady gig was at CBS stations in Detroit. He was laid off two years ago, about the same time he grew ill. Working for KAKC in Tulsa, is where he started my production company. "I did novelty songs for a car dealer, and these songs ended up being his advertising campaign. I did that same package for about ten car dealers across the country. I think the first station I ever did sweepers for was a little station in Clyde, Ohio." In '80, he worked with Malrite and helped them set up KNEW in San Francisco, According to a 1993 with Radio&Production magazine, 'By this time, I was your basic, full-fledged cocaine addict. Then I had a mild heart attack. My parents had a little winter home down in Tampa, Florida, so I went down there, dried out, and went to work for a little recording studio there. After a while, I got a call from an old boss of mine, Gil Rosenwald, saying they were buying this station in Livingston, New Jersey. The studios were in Livingston, New Jersey, but the transmitter was in Newark, and they were going to move to the Empire State Building. He wanted to know if I wanted to go work for them. I said, "Who's your PD?" He said, "Scott Shannon." Well, I knew Scott from Tampa, and Scott and I were two people just alike -- two stubborn, bull-headed people. The station was Z100, and we had a lot of fun." "We were there for about three months before we actually signed the thing on, going through tapes, building the studios, etc.. I didn't want to be on the air. I was just going to do creative for them. Then, about a week before we were going to sign on Scott said, "Well, did you ever read news?" And I said, "I've never read news in my life!" and he said, "Well, you're going to start now." Oh, it was nice. It's your first time trying to be a news person, and where are you? In New York City. It's a humbling experience, but I only had to do news until we hired someone. Anyway, everybody did everything they had to do in the beginning. The production part to me was the most fun because we had a ball at that station." ➦In 2015...Lesley Gore, an American singer, songwriter, actress, and activist, died from lung cancer at age 68. At the age of 16 (in 1963) she recorded the pop hit "It's My Party", and followed it up with other hits including "Judy's Turn to Cry", "She's a Fool", "You Don't Own Me", "Maybe I Know" and "California Nights". Gore also worked as an actress and composed songs with her brother, Michael Gore, for the 1980 film Fame, for which she was nominated for an Academy Award. She hosted an LGBT-oriented public television show, In the Life, on American TV in the 2000s, and was active until 2014. Cox Enterprises on Friday announced a deal to sell a majority stake in its portfolio of 14 television stations, including WSB-TV/Channel 2 Action News, to an international investment firm. The TV properties will become part of a new media company headquartered in Atlanta. Investment funds affiliated with Apollo Global Management will hold the controlling interest in the Cox Media Group television properties, as well as Cox’s newspapers and radio stations in Ohio. 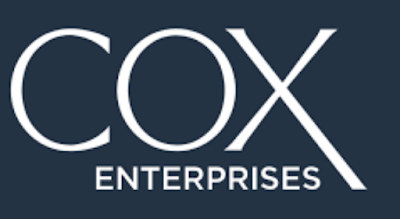 Cox, a privately held broadband, automotive services and media company based in Sandy Springs, will remain a minority owner of the new company. Financial terms of the deal were not disclosed. The agreement is subject to regulatory approval, which could take about six months. In July, Cox said it would explore strategic options for its television properties, and at the time said that could include partnering or merging its stations into a larger company.The regional television industry has seen a wave of consolidation. Much like the newspaper and radio industries, the broadcast TV business has battled a shift in advertising dollars to internet rivals, including Google and Facebook. But fees stations collect from cable operators remain potent sources of revenue. Cox’s stations are among the best-performing in the industry. TV operators, clamoring for scale amid expected changes in regulatory conditions, coveted the Cox portfolio. Some 11 bidders, which Cox declined to name, expressed interest in the stations. “These stations have decades of experience breaking barriers and delivering the news and information their communities need daily,” said Alex Taylor, president and CEO, Cox Enterprises. “We wanted to find a company that is committed to investing in broadcast television now and in the future, and we found that in Apollo.”Apollo is an international investment company and managed about $280 billion in assets at the end of 2018. The company’s business lines include private equity, real estate and credit, and the business has subsidiaries in chemicals, retail, financial services, hospitality and media. Apollo is a new entrant into the local broadcast television business. A recent Reuters report said Apollo is bidding for some stations from Nexstar Media Group and has an agreement to purchase stations from Northwest Broadcasting, an operator of local TV stations in the Pacific Northwest region. 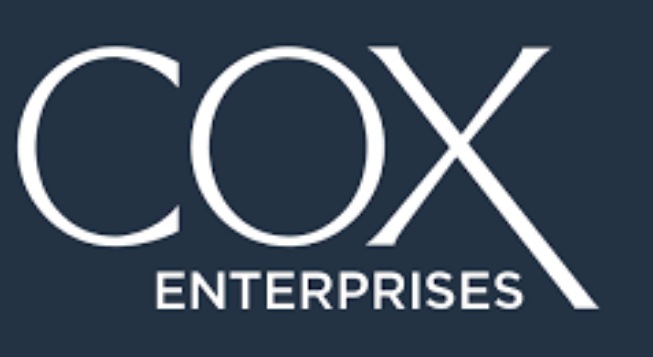 Cox owns or has interest in stations in some of the nation’s top local television stations, including in Seattle, Boston, Charlotte, Orlando, Pittsburgh, Memphis, Jacksonville, Tulsa and Dayton, Ohio. The stations, which include WSOC-TV in Charlotte, WPXI-TV in Pittsburgh and KIRO-TV in Seattle, reach more than 31 million viewers nationwide. Cox Media Group retains its ownership of The Atlanta Journal-Constitution, WSB radio, several other Atlanta radio stations and media properties in other markets. The operations of the AJC and the Atlanta radio properties will be unaffected by this deal.Cox, in its strategic review, sought to find a partner interested in building a broadcast television company committed to growing scale to better compete nationally and to uphold its journalistic standards, the company has said. TV: WSB-TV, ABC Atlanta, Ga....WSOC-TV, ABC Charlotte, N.C....WHIO-TV, CBS Dayton, Ohio...WFOX-TV, FOX Jacksonville, Fla....KOKI-TV, FOX Tulsa, Okla....WFTV-TV, ABC Orlando, Fla....WAXN-TV, Independent Charlotte, N.C....KIRO-TV, CBS Seattle, Wash....WFXT-TV, FOX Boston, Mass....KMYT-TV, My Network Tulsa Okla....WRDQ-TV, Independent Orlando, Fla....WPXI-TV, NBC Pittsburgh, Pa....WHBQ-TV FOX, Memphis, Tenn. This special presentation, commissioned by Country Radio Seminar (CRS) for their 50th anniversary, looks at both the present and the future of Country, radio, and how music gets passed down…and up. This comprehensive study is based upon both a national survey of parents and teens, and also video ethnography of how these two very important groups interact with music, the radio, and each other. 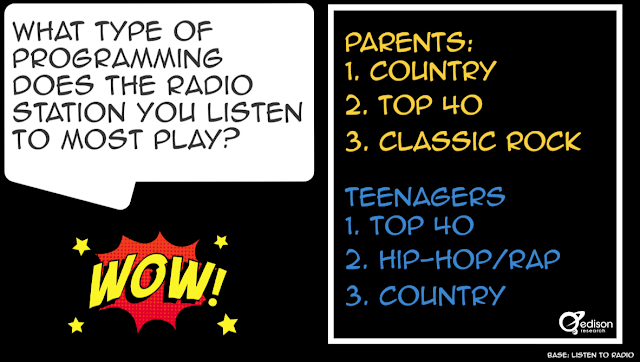 According to Edison’s industry-leading Share of Ear® study, AM/FM radio remains the top platform for teens, with 63% of 13-19 year-olds listening to radio every day. Why would I sit through a ton of ads? 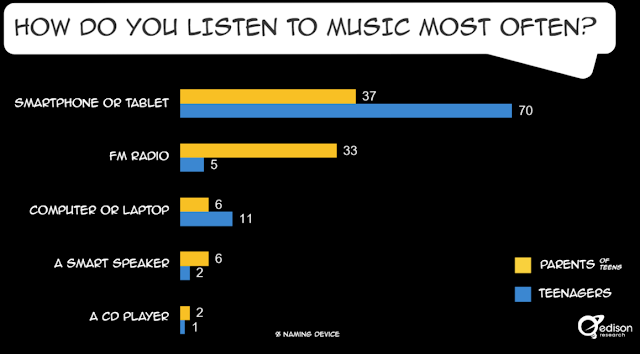 The music I like is on my phone. I never listen. I plug in my phone to listen to my own music. Why would I listen to a song I don’t want to listen to? I have Spotify. Remember, kids have basically grown up with cell phones in their hands. Millennials’ recognition of songs from the 1960s through the 1990s is relatively stable over this 40-year period, a team of researchers has found. By contrast, their recognition of musical hits from 2000 to 2015, while higher overall than the previous era, diminishes rapidly over time. 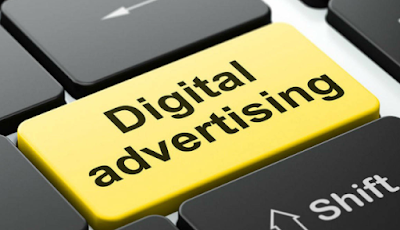 U.S. digital advertising revenues rose to $26.2 billion in the third quarter of 2018, solidifying 2018’s claim as the highest-spending first three quarters on record, according to the latest IAB Internet Advertising Revenue Report released Thursday by IAB and prepared by PwC US. Digital spend for Q3 2018 estimates increased 20.6 percent over Q3 2017. In total, marketers spent $75.8 billion during 2018’s first three quarters—22 percent more than they had spent during the same period a year ago. The Q3 revenue estimates are based upon a survey of the largest companies, which are then projected to the overall market based upon recent historical revenue market share. The estimates are updated, when necessary, in connection with the more detailed analysis prepared for the IAB’s half year and full year reports. IAB sponsors the IAB Internet Advertising Revenue Report, which is conducted independently by PwC US. The data is compiled directly from information supplied by companies selling advertising on the internet. The survey includes data concerning online advertising revenues from web sites, commercial online services, free e-mail providers, and all other companies selling online advertising. The full report is issued twice yearly for full and half-year data; and top-line quarterly estimates are issued for the first and third quarters. PwC does not audit the information and provides no opinion or other form of assurance with respect to the information. To view previous reports, please go to www.iab.com/adrevenuereport. Shares of CBS Corp.—the parent company of the namesake TV network, Simon & Schuster publishers, and the Showtime premium cable channel—slumped in after-hours trading Thursday on disappointing fourth-quarter results. Forbes reports profit at the New York-based company was $561 million, or $1.49 per share, reversing a year-ago loss of $41 million, or 10 cents per share, reflecting the spin-off of CBS's radio business. Revenue in the three-month period ended December 31, 2018, rose 3% to $4.02 billion, from $3.92 billion. 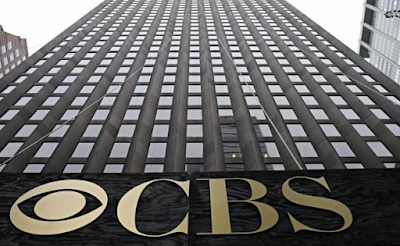 Wall Street analysts on average expected CBS to earn $1.53 on revenue of $4.15 billion. Among the highlights was a 7% increase in advertising revenue driven by strong demand from the mid-term elections. The company also announced that it had reached its goal of eight million subscribers for its CBS All Access and Showtime streaming services nearly two years ahead of schedule. As a result, CBS's affiliate and subscription fee revenues rose 11% to $1.03 billion. The company has set a new 2022 goal of getting 25 million subscribers for both direct-to-consumer services. Lowlights included content licensing and distribution revenue, which fell 11% to $1.06 billion because of "timing issues" regarding several large international and domestic sales that weren't specified in the company's earnings release. Results at the company's entertainment business, its largest since it includes CBS, fell 1% to $2.83 billion while operating income dropped 6% to $438 million. Wall Street analysts are expecting CBS to merge with its former corporate sibling Viacom before the end of the year, a deal that controlling shareholder Shari Redstone has wanted for years and had to battle a Moonves-backed lawsuit to get. The combined companies would have a market capitalization of roughly $30 billion, a fraction of the market value of rivals such as Walt Disney ($165 billion) and Comcast ($169 billion). CBS will have to go on a shopping spree in order to avoid being overwhelmed by its much larger rivals. Among the rumored targets are Discovery Communications and Sony Pictures Entertainment. CBS is prepared to “do what is necessary” to hang on to its NFL rights. That was the message sent by CBS acting CEO Joe Ianniello and CBS Sports chief Sean McManus Thursday during CBS’ fourth-quarter earnings call, reports Variety. Ianniello and McManus both talked up the virtues of having the NFL on broadcast TV, which remains ubiquitous even in a fragmented media landscape. 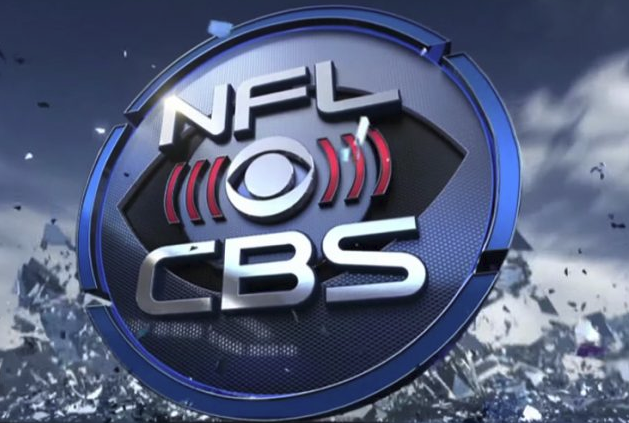 CBS’ deal for its Sunday afternoon package of AFC games runs through 2022, and already there is much speculation in media and Wall Street circles about CBS and other broadcasters vying against digital behemoths in the next round of NFL rights talks. McManus said he believes the NFL will continue to “strongly value and prioritize the reach of broadcast television” as it considers options for new rights deals. Big-ticket sports and event rights are seen as crucial to the survival of linear TV, which still has an advantage over on-demand streaming platforms in drawing crowds for must-see live broadcasts. McManus predicted that substantive talks between major networks and the league will not begin until next year as the NFL first has to hammer out what is expected to be a tough new collective bargaining agreement with its players. CBS has had good relations with the league ever since it reacquired football rights in 1998, after being outmaneuvered by Fox in 1993. Ianniello emphasized the growth in CBS’ direct-to-consumer platforms — CBS All Access and the standalone Showtime app — that has paced ahead of projections the company made in 2016. Together, CBS All Access and Showtime have surpassed 8 million subscribers, a benchmark that CBS originally projected it would hit in 2020. Ianniello said the company’s new growth target is for both to have 25 million by 2022. Univision Communications Inc. swung to a loss in the fourth quarter, hurt by a large impairment charge on its English-language digital unit and a carriage dispute with Dish Network Corp. that negatively affected the Spanish-language broadcaster’s revenue, according to The Wall Street Journal. The carriage dispute, which began in June and continues, is depriving the company of subscriber fees and shrinking the size of its viewership, weakening its ad-sales business. The closely held broadcaster said that non-advertising revenue at its media networks unit, which includes subscriber fees, was $279.6 million in the fourth quarter, down 11% from $315.7 million a year earlier. Advertising revenue in that unit fell 6.6% to $337 million. Univision also took an impairment charge on Gizmodo Media Group, its English-language digital business, of more than $120 million in 2018. Univision purchased many of the websites in Gizmodo Media Group, including Gizmodo and Lifehacker, for $135 million in a bankruptcy auction held in 2016. It already owned The Root, an African-American news site, and a stake in The Onion, a satirical news site. It put all of those properties up for sale in July, and the process is continuing. “These digital brands are longstanding, well-recognized sources of news, information and entertainment in their verticals that we believe can thrive as part of a company whose focus better aligns with theirs,” Univision said in a written statement. The MLB Oakland A’s have a new radio home for the 2019 season. The A’s announced Friday morning that Salem Media's KTRB 860 AM The Answer, the club’s radio home from 2009-10, will broadcast all of their games this upcoming season. 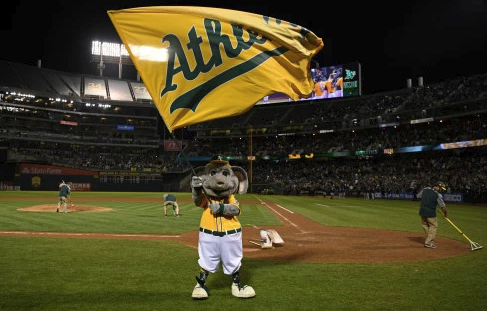 That deal will expand to Bonneville's Sports KHTK 1140 AM in the Sacramento area, making it the largest coverage map the A’s have ever had, according to The Mercury News. In addition to games on traditional radio, the A’s also announced a partnership with TuneIn, a free live audio streaming service, to launch a 24/7 exclusive A’s station which will include free streaming of all A’s games for those living within their territory. The station will also produce exclusive team programming. The A’s are the first team in MLB to have an exclusive partnership with a free streaming service. "Our new partnerships with KTRB 860, KHTK-AM 1140, and TuneIn significantly amplify our coverage and reach, ensuring that every Spring Training and regular season game will be available throughout Northern California. These partnerships will allow us to reach A's fans from as far north as Butte and Mendocino Counties across the Bay Area and down to Fresno and Monterey, with both terrestrial and free streaming broadcasts," said A's COO Chris Giles. "We are also thrilled to launch a 24/7 A's channel on TuneIn and deliver exclusive content and unprecedented coverage throughout the season." Ken Korach will return for his 24th season with the A's and his 14th as the team's lead radio announcer, pairing with Vince Cotroneo, who will begin his 14th season with the Club. Ray Fosse will also make special appearances in the booth throughout the season. The team will debut expanded pre and postgame shows - A's Total Access and A's Clubhouse - hosted by Chris Townsend. KIQI 1010 AM San Francisco and KATD 990 AM Pittsburg will serve as the Spanish-language home of Oakland A's baseball, broadcasting 72 games. Amaury Pi-González, will return for his 26th season with the A's and 36th season overall in MLB. González will be joined by Manolo Hernández-Douen, who will begin his 11th season as an A's analyst. KTRB 860 AM will air every A's game, and KHTK-AM will air every game, minus Sacramento Kings game conflicts. The A's TuneIn channel can be accessed at tunein.com/athletics.com.